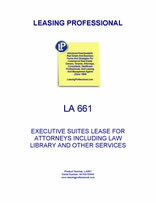 Other Features Lease termination requires two months notice, provision requiring special payments if tenant attorneys hire landlord employees, prohibition against tenant attorneys representing landlord employees, detailed executive suites rules and regulations covering common areas, signage, directory boards, door lettering, keys, carpeting and wall coverings, improvements, conference rooms, telephone, mail sorting, and reception, copying and faxing, and parking, among others. THIS LEASE IS NOT TO BE CONSTRUED AS AN OFFER AND IS NOT BINDING ON EXECUTIVE SUITES LANDLORD, INC. UNTIL IT IS SIGNED BY AN OFFICER OF EXECUTIVE SUITES LANDLORD, INC. This Lease (“Lease”) is made as of _________________, by and between EXECUTIVE SUITES LANDLORD, INC., a __________________ corporation (“Landlord”), and EXECUTIVE SUITES TENANT, INC., a _________________ (“Tenant”). This Lease is subordinate to the lease with the Building ("Master Lease") dated _____________ (as amended). Tenant desires to lease from Landlord a certain portion of the Suite for the purposes of conducting Tenant's business together with rights in common to the "common areas" of the Suite. 1. LEASED PREMISES. Landlord agrees to lease to Tenant and Tenant agrees to lease from Landlord portions of the Suite described herein (the “Premises” or the “Leased Premises”) and on the floor plan attached hereto as Exhibit A. In addition to the exclusive use of the Premises, Tenant shall have the non-exclusive right in common with Landlord's other Tenants to use all common areas and facilities available in the Suite. Except as otherwise agreed to in writing, Tenant takes the Premises in an "as is" condition. Tenant shall be prohibited from using or occupying any premises other than those premises designated in this Lease as the Premises. In the event that Tenant uses or occupies any space other than the Premises without Landlord's written consent. Tenant shall pay Landlord a sum designated by Landlord for the unauthorized use of said space. 2. TERM. Except as it may be modified by the applicable provisions of this Agreement, the term of this Lease shall be for a period of six (6) months, commencing on _________, 20__, and expiring on ___________, 20__. If the term commences on a day other than the first of the month, the term shall expire on the last day of the month identified herein, provided at least two (2) full calendar months advance written notice of termination has been provided to Landlord in the manner described in section 3 of this Lease. In the event the Premises are not ready for occupancy on the commencement date, this Lease shall remain in full force and effect provided Landlord makes the Premises available for occupancy within forty-five (45) days of the scheduled commencement date. In such case all rent shall be abated until Landlord makes the Premises available for occupancy. Landlord shall not be liable to Tenant for any loss or damage arising from any delays. Tenant's sole remedy shall be the right to cancel this Lease in the event Landlord fails to deliver possession of the Premises as set forth herein. Tenant is advised that any floor plan or plans provided by Landlord are not to scale, the measurements are not always accurate, and the Premises are not always built exactly as shown on the floor plans. 3. LEASE TERMINATION. Either party may terminate this Lease at the expiration date set forth herein by giving two (2) calendar months advance written notice effective on the expiration date set forth in section 2 of this Lease. If neither party sends written notice of termination to the other party two (2) calendar months in advance of the expiration date, this Lease shall automatically become a month-to-month agreement REQUIRING AT LEAST TWO (2) FULL CALENDAR MONTHS ADVANCE WRITTEN NOTICE TO TERMINATE THE LEASE, EFFECTIVE THE END OF THE SECOND FULL CALENDAR MONTH. IF THE LEASE HAS EXPIRED AND BECOME A MONTH-TO-MONTH AGREEMENT, OR IF THE ORIGINAL TERM OF THE LEASE WAS MONTH-TO-MONTH, TWO (2) FULL CALENDAR MONTHS ADVANCE WRITTEN NOTICE OF TERMINATION IS REQUIRED, AND ANY SUCH TERMINATION SHALL ONLY BE EFFECTIVE THE END OF THE SECOND FULL CALENDAR MONTH. FOR EXAMPLE: IF WRITTEN NOTICE OF TERMINATION IS RECEIVED BY EITHER PARTY BY APRIL 30TH, ANY SUCH NOTICE SHALL BE EFFECTIVE JUNE 30TH. IF WRITTEN NOTICE OF TERMINATION IS RECEIVED BY EITHER PARTY ON MAY 1ST OR ANY LATER DATE IN MAY, ANY SUCH NOTICE SHALL NOT BE EFFECTIVE UNTIL JULY 31ST. Landlord's rent increase notice is not to be construed as a termination notice. All notices must be given pursuant to section 13. If Tenant fails to vacate the Premises for any reason after the termination date or purports to rescind the termination notice after Landlord has already leased Tenant's terminated space, Tenant will pay the rent the new tenant had agreed to pay, plus any and all resulting damages and losses incurred by Landlord because the new tenant cannot move into the space previously terminated by Tenant. In addition to the above rent, Tenant shall be obligated to pay rent for any space within the Suite which Tenant occupies but which is not included in the Premises (the "unrented space"). Tenant's obligation for said unrented space shall be at the rate set forth in Landlord's written notice to Tenant concerning Tenant's occupancy of the unrented space. Tenant's obligation to pay rent for the unrented space shall be effective as of the date in which Landlord gives Tenant written notice of the rent to be paid for said space, and occupancy of the unrented space shall be subject to all terms and conditions of this Lease. The terms and conditions of this Lease are confidential, and Tenant agrees not to reveal said terms and conditions to any third parties. Tenant's disclosure of the terms and conditions of this Lease shall be cause for Landlord at Landlord's sole discretion to immediately terminate this Lease, or increase Tenant's rental rates to Landlord's current asking price.